IT support services are something that every business nowadays needs, but outsourcing the services might be more beneficial for your business than having a dedicated IT department. Almost all businesses nowadays depend on computers and other types of technology to efficiently maintain operations. Yet, since these devices are man-made ones, they are subject to human errors. In order to keep your business functioning properly, reliable IT support in Riverside is needed for fixing process malfunctions and other technological issues. One of the most notable benefits of outsourcing IT support is the cost savings that your business will experience. When you have your own in-house IT support department, you have to pay those employees and pay for the upkeep of that department. Any skilled network administrator could cost you a considerable amount in salary and benefits, and there are other IT department employees that will have to be hired as well. When you outsource, though, you get IT expertise without having to incur the expense of an in-house department. Outsourcing IT support also allows you to take advantage of a greater knowledge base that you wouldn't have had access to otherwise. IT support centers have many techs who possess multiple skill sets, whereas most businesses can't afford to hire more than one, two or three employees who often have limited skill sets. This alone is enough of a reason to outsource IT support. IT support centers can send a technician with targeted experience and skills related to the specific problem that you're experiencing. Of course, outsourcing your IT support needs will also enable you to focus all your resources on your business. This helps ensure that you take care of what you're good at, attending to your core business functions such as customer service and meeting service demand. 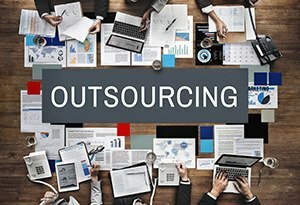 Although it might be tempting to do everything yourself, outsourcing allows your employees to focus on their core competencies instead of dealing with the day-to-day hassle of computer network problems. You can derive the greatest benefit from outsourcing your IT support needs and dedicating your employees' time and strengths to what they're best at.